at a reception hosted by the Lord Provost. The registered design was created by local man, Archie Martin, who worked at East Lothian council for twenty three years as a landscape architect and was the winner of a competition to select a county flag, launched in late November 2017. A total of 1,532 votes were cast. The flag is seen below wielded by Philip Tibbetts, “Honorary Vexillologist” to the Court of the Lord Lyon. The venture was organised jointly by East Lothian Council and the Scottish Flag Trust, in association with local newspaper East Lothian Courier, under the auspices of the Scottish heraldic authority, the Lord Lyon. 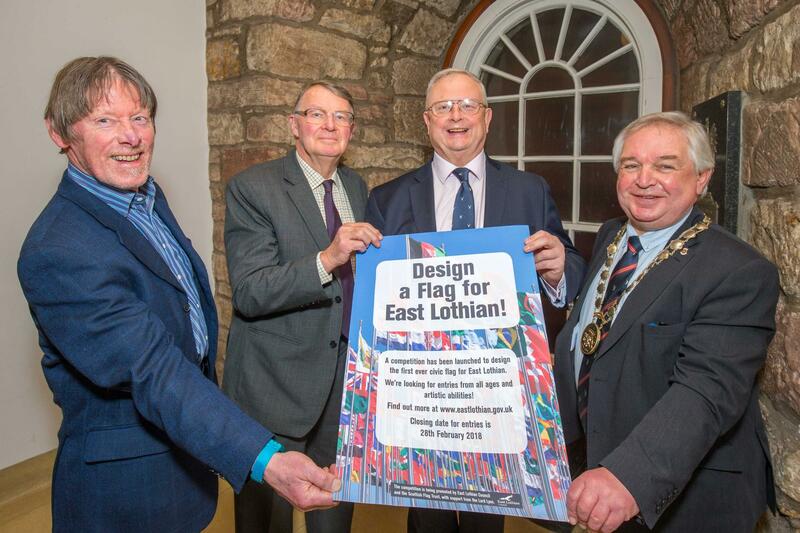 at left, Dave Williamson, of the Scottish Flag Trust; Michael Williams, Lord Lieutenant of East Lothian to his right; Joseph Morrow, Lord Lyon and at far right, Provost of East Lothian, John McMillan. The competition ran through February 2018, closing on the 28th. It received a whopping 623 entries, from as far afield as the USA and New Zealand. Councillor John McMillan, East Lothian Provost, said: “I am absolutely overwhelmed that we received so many entries of such a high standard. comprising the Lord Lieutenant of East Lothian, Michael Williams MBE; Lord Lyon Joseph Morrow; East Lothian Council Provost John McMillan and Chief Executive Angela Leitch; David Williamson, Chair of the Scottish Flag Trust and Robbie Scott, Editor of the East Lothian Courier, at Haddington on the 8th of June 2018. The four finalists were entered into a public vote which ran until the end of August. Regrettably the four chosen designs did not present best design practice, as outlined here https://flaginstitute.org/…/Flag_Design_Commission_Report.p…. Specifically, the judging panel exhibited a very limited design remit; whilst the choice of colours evident in these choices, blue for sea, yellow for a sandy beach, green for land, is not inappropriate, it was a trite and tired option. Which territory on Earth with a shoreline, could not be represented by such colours? What do they say directly about East Lothian that could not be representative of Fife, for example, or Argyll perhaps? If these colours must be used, one might hope for a more imaginative arrangement than a tricolour of stripes, there being already, quite a few flags with stripes in the world! Is a green, yellow and blue tricolour something that is going to stand out? The winning design, was really the only viable option. The blue stripes through the gold are also intended to represent the county’s rivers Esk and Tyne, with the gold colour signifying the wealth of East Lothian’s farmlands and reputation as the granary of Scotland and recalling the traditional sun symbol of the Lothian region, detailed further below. However, whilst a recognised, national, symbol, it is questionable whether a lion rampant specifically evokes East Lothian as a county? Although rampant lions have certainly appeared on the arms of local nobility and the local authority, the county is associated with several more locally resonant devices, a blazing sun; a goat; a goat and ivy combination; a peregrine falcon, as appear on the sample of rejected designs shown below. The lion is palpably not unique to East Lothian and it is not remotely distinct, lions appear across Scotland, the UK, Europe and the World. The other three finalists were parlous flag designs that should never have made it into any final selection. Design B featured a map, always a poor choice on a flag, suggesting that, being unable to think of anything more meaningful, in desperation, the designer has just copied a shape. Maps are often the last resort for flags and usually denote territories in dispute, as a neutral design, avoiding symbols or emblems of the sides in dispute, for example, Cyprus , Kosovo and the joint Korean Olympic flag. Such usage here was neither necessary nor appropriate. When viewed from any distance this shape from a map, would just appear as a coloured blob and thus be essentially meaningless. This design flaw was compounded by being an incorrect shape! The map denoted the council’s administrative remit, NOT the actual county of East Lothian, so could not be considered representative of the actual county of East Lothian. A further flaw was the inclusion of one flag on another, as part of its design; complicated, confusing, unnecessary. Many English county flags have used the form of a cross of Saint George as the basis of a flag but none of them have that actual flag as part of the local design. As a Scottish county East Lothian might opt to deploy a saltire form in its flag, there are a number of such proposals for other Scottish counties, shown on these pages and of course, East Lothian is the acknowledged birthplace of the Scottish saltire, so a nod to the national flag is an obvious and very relevant element to include but an imaginative design would fashion a saltire in locally meaningful colours or bearing distinct local devices, as found in the sample of rejected designs shown below; simply repeating the national flag is a dull, pedestrian approach and its depiction was also crude and comic, looking like something from a cartoon. It was never likely to raise passion or inspire a firm local identity. Flag C appeared to be an unmodified child’s scribble. It seemed to be a depiction of a green hill with the Scottish saltire beaming out into the sky from one side. Crude and amateurish, allegedly the blue was in fact supposed to be the sea! It’s highly unlikely that anyone would have recognised this. Again, use of the national flag on a local one, as described, is inappropriate and unimaginative. Imagine this “flag” flying thirty feet in the air, fifty feet away, would such a design stir the soul, even if one could actually make out what was being looked at?! is a simple combination, which makes dull stripes more interesting, and lends the national symbol something of a local flavour. The best flags are kept simple, such a design could be easily drawn by hand and be fairly easy to discern from any height or distance. Unfortunately a lion rampant was added to the mix. Whilst this arrangement might look attractive on a static page or screen it would not translate well when flapping in a gust or hanging limply, the more details there are, the less identifiable it is. When in flight, thirty feet high, fifty feet away, the lion, again, would just look like a blob against the other colours. Many people designing flags fall into the trap of throwing everything they can think of into the arrangement, failing to recognise that less is more; the simpler the design, the more discernible it will be, the more eye catching it will appear. And again, whilst, as described, the lion rampant is an obvious, national, its specific local symbolism is not obvious. A very generic arrangement, with a “Scottish feel”, it has nothing specific to say about East Lothian and indeed something similar represents Nova Scotia to reflect its Scottish roots. A further flaw with Design D is that it flouted the rule of tincture, an originally heraldic “rule” that serves to enhance visibility by keeping dark colours, blue, black, red and green, separate from light ones, yellow and white. Thus a blue charge is visible against a white or yellow background but barely seen against a black one, for example. 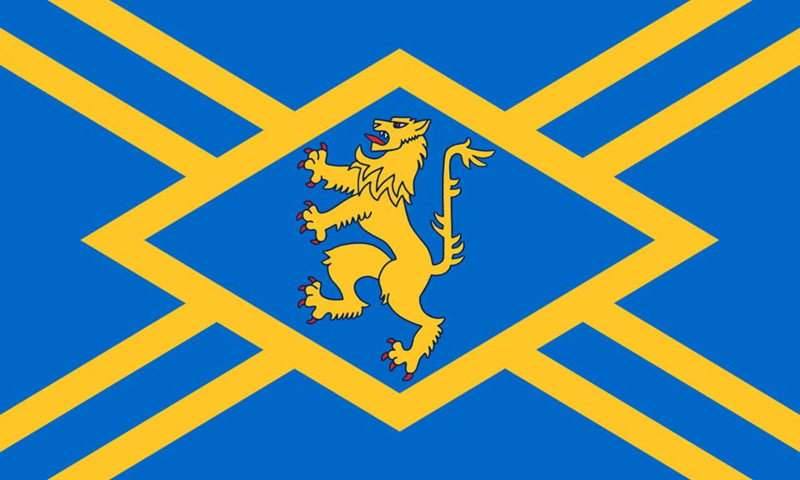 Design D placed a yellow lion, against a white cross, against a yellow central stripe, flouting the recommendation twice; its visibility would be very limited, especially when in the form of a cheaply made, budget flag, which are the vast majority of flags flown. A critique of the above three, below par, finalists, analysing how they specifically failed to meet the recommendations of good flag design, as promoted by such bodies as NAVA and the Flag Institute, can be read here. were six very distinct and varied designs. presenting a real choice to voters. There is a glaring disparity between the very similar, final four designs in the competition and the widely varying range of submissions received. The goat and ivy tree have also historically represented the county as a whole. Here, appearing as the badge of the Haddingtonshire Rifle Volunteers. fashioned in the form of a saltire, again to reflect the county’s recognition as the birthplace of the Scottish flag. used by the Giffords of Yester, a family given lands in East Lothian, by King William the Lion (1165-1214). again features a striped field, recalling the pattern of the council’s arms, in two blue shades, referring to the varying realisations of the blue field in the Scottish national flag. flying over Lammerlaw in the county. Critical analysis of competition finalists. This entry was posted in East Lothian - Haddingtonshire, Lothian. Bookmark the permalink.